Zone 9 Milan has many industrial areas, with several factories in the area, most notably Pirelli. Some campuses of the Milan Polytechnic (in which are including its engineering departments) are in this zone. 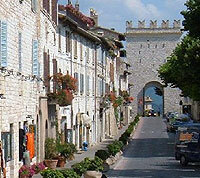 Porta Nuova is the name of an old gate that was part of the city's 12th-century fortifications. However, the gate has undergone several architectural facelifts, as it was restored and re-embellished in 1861 and again in 1931. The neighbourhood of Porta Nuova is located just west of Corso Como, near the Stazione Centrale. Unlike the other Milanese districts close to the main railway station, Porta Nuova is fairly quiet and upscale, with a cultivated air enhanced by its genteel, tree-lined streets. A number of the finest hotels in Milan have chosen to be based in Porta Nuova. The neighbourhood is well-connected to all parts of the city, and in particular it is close to Brera, Parco Sempione, and the Giardini Publicci by Porta Venezia. Recently the area has been experiencing urban redevelopment. Plans call for 360,000 sq. m of new residential, commercial, and office buildings to be constructed. A large park with community and cultural centres is also in the works. The redevelopment is expected to be done by 2011.